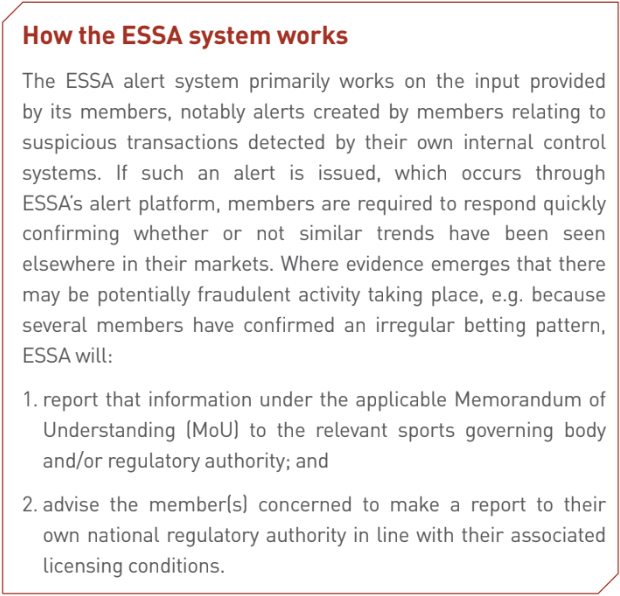 ESSA has reported a total of 62 cases of suspicious betting to the relevant authorities during the second quarter of 2018, involving eight different sports. The international betting integrity body highlights the vast majority (44) emanated from tennis, with football next in line with 12 suspicious alerts, followed by bowls, handball, boxing, basketball, beach volleyball and esports which had one case each. Khalid Ali, ESSA Secretary General, commented: “We have played a crucial role in bringing transparency to betting related match-fixing, which is why we have taken a keen interest in the recent publication of the Interim Report into tennis by the Independent Review Panel. “We are seeking to deliver a number of alternative evidence-based options that we hope the Panel, and the various governing bodies within the sport, will be willing to explore in more detail, and to reaching a position that is mutually beneficial, places integrity to the fore and also serves to avoid any adverse commercial impacts”. Amongst the report was a guest comment from Sara Slane, senior vice president of public affairs at the American Gaming Association, explaining what the legalised sports betting landscape could look like, as well as addressing work carried out between both parties with the aim of “creating an ‘ESSA style’ model for the US market”. Speaking of the US market, Slane commented: “As legal sports betting becomes a reality in the United States, the American Gaming Association (AGA) looks to ESSA as a model for promoting sports betting in a safe and regulated environment, while ensuring the integrity of games.